2. Dip both sides of eggplant slices in egg, and let egg drip off. 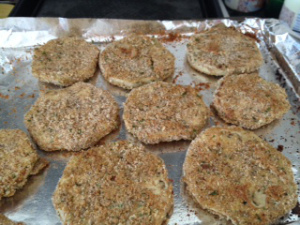 Then press each side in bread crumbs. Place in a single layer on a foil lined baking sheet, sprayed with PAM. Bake in preheated oven for 10 minutes on each side. 3. In a 9x13 inch baking dish spread marinara sauce thinly to cover the bottom. Place a layer of eggplant slices in the sauce, layer first with fresh spinach leaves and then mozzarella cheese. Repeat with remaining ingredients, ending with a sprinkle of Parmesan cheese. Sprinkle basil on top. 4. Bake in preheated oven for 35 minutes, or until golden brown.